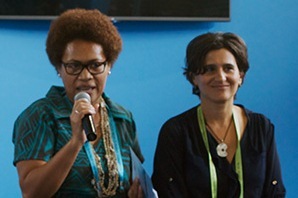 Alejandra Pero, WIN Coordinator, and Ruci Botei from IUCN Oceania, humbly welcomed attendees to the opening of the WIN & Pacific Community Dialogues Pavilion. Mikaela Jade from Paramodic based in Australia, commenced the opening by paying respect to the traditional owners of the land. 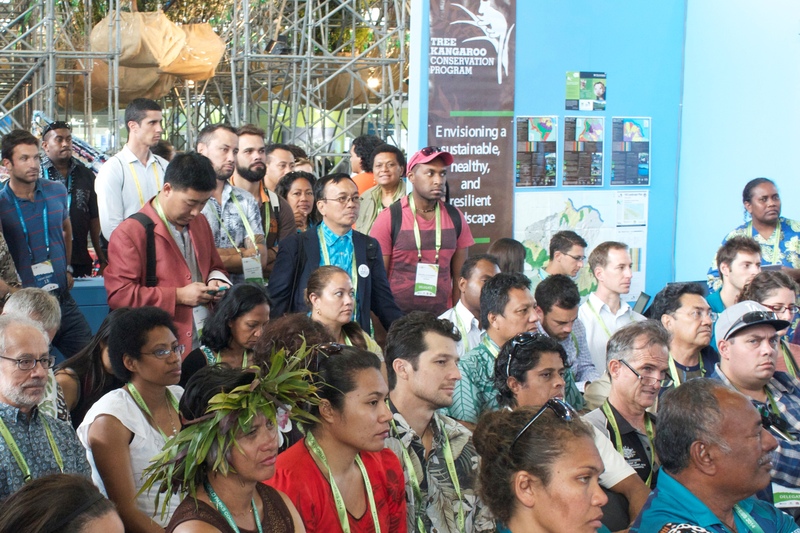 Ms. Pero and Ms. Botei highlighted the dynamic sessions that would happen throughout the week ranging from workshops, community dialogues, press conferences, receptions, book launches, kava tastings, film screenings, 3-D community mapping, and more! Ms. Ruci also announced the honorable arrivals of the Presidents of Palau and Kiribati, and the Prime Minister of the Cook Islands. Ms. Pero emphasized the importance of using the WIN & Pacific space as their own meeting area to foster dialogues and exchange ideas. The pavilion is also partnering with the IUCN Commission on Environmental, Economic, and Social Policy (CEESP). 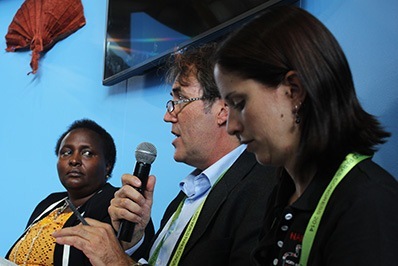 Lucy Mulenkei, who manages the Indigenous Information Network (IIN) in Kenya, began the session by explaining how recent technology has been used to empower local and indigenous communities to track their lands and natural resources. I-tracking, an example of this, stands for indigenous tracking. 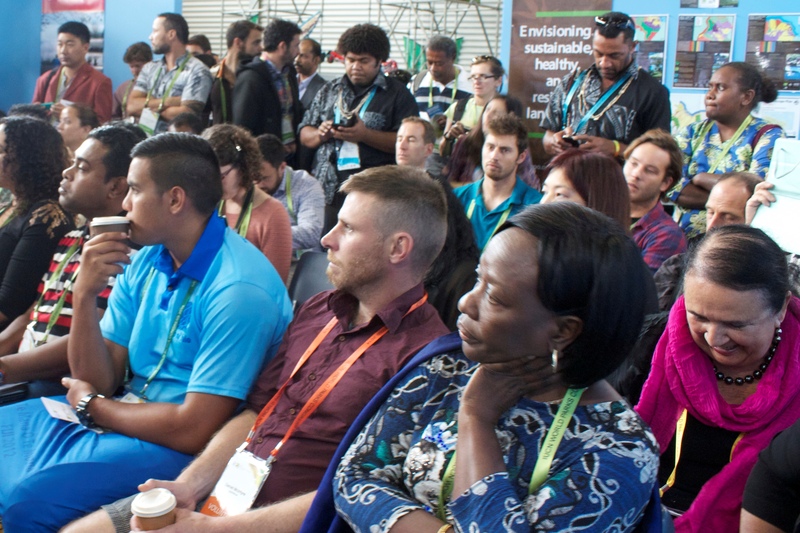 The event brought together an international panel representing Mexico, Australia, Indonesia, and Kenya, and more than 100 attendees. Jose Ines Loria Palma, President of the San Crisanto Foundation in Mexico has worked with communities to map and record data on 35 cenotes (sink pits).This work was conducted by using small shipping boats. The mapping has not only help to improve economic livelihoods, where people can make weekly incomes over $100, but it has served as a mechanism to educate people about the importance of mangroves preservation. 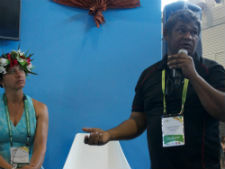 Loria mentioned that there is still a disconnect between how communities and governments perceive the benefits that mangroves provide. Now, San Crisanto is working in an area that has been damaged by methane gas extraction. San Crisanto is an Equator Prize 2010 winner. Dr. Rod Kennett from the Australian Institute for Aboriginal Studies said that tools like i-tracking make natural science relevant to indigenous peoples. Kennett described his work as a business of managing information and data through native titles. He mentioned that “there have been new developments of management plans to empower and allow people to collect data in a meaningful way to them, to improve their own community based management plans”. 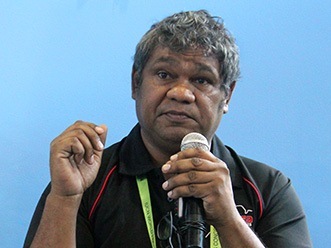 Misha Jackson is the I-Tracker Project Development Office with North Australian Indigenous Land & Sea Management Alliance (NAILSMA), based in Darwin. Jackson works to empower land and sea managers by training them to record and report data that is meaningful and beneficial for both the scientific community but more importantly local communities. “Data is collected on items such as cultural heritage, scientific and research based projects, endangered species and feral animals,” Jackson noted. In order to consolidate the data, NAILSMA uses CyberTracker, a free GPS field data collection system that produces maps, applications, and reporting outputs. “These customized tools are based on the priorities that communities want, and it is they who have ownership over how that information is used,” Jackson mentioned. Additionally, NAILSMA facilitates working groups that decide what to collect and how to apply it to community needs. 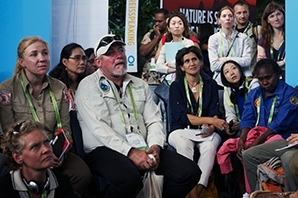 Cliff Marlessy, an Equator Prize 2008 winner with the Community-based Marine Management Foundation from Indonesia, explained how coastal communities manage their natural resources. Most of Indonesia’s natural resources are owned by the national government. Marlessy explained how mapping has been used to monitor catchment areas and traditional fishing grounds. The mapping process has helped communities in Tanah Merah Bay, for example, to agree upon common fishing grounds. Marlessy’s concluded that “participatory mapping has helped people to increase awareness of their own natural resources and how to manage them properly”. Jenniffer Koinante, a member of the Yakuu minority of indigenous peoples from Kenya, works with forest communities to employ 3D mapping to cover their territories. The mapping process has brought people together to have meaningful dialogue regarding land issues. Koinante stated that “3D mapping has enabled us to put the entire forest on a table where we can make progress towards wildlife conservation, and plan ways to govern our property”. The mapping has also been used to resolve and prevent conflicts which have been especially important because the Yaku people’s land is constantly under threat. Koinante noted that “we also use mapping to maintain culture” and that cyber-tracking has been used to collect movement of animals and plant species. “We can understand the pattern of life however climate change has begun to pose challenges due to the irregularity of seasonal patterns,” she concluded that “we need mapping more than ever to know how to prepare for different seasons and movements”. The following discussion identified remaining challenges such as land rights, illegal exploitation of resources, conflict resolution, and general data management, ownership, and accessibility. Ms. Mulenkei noted that community maps often reflect something entirely different from maps created by national governments. 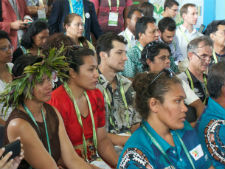 This event reflected on community experiences in managing protected areas. The attendance of 120 people was a testimony to the relevance of the topic. Kelly Brown, a member of the Heiltsuk Nation in British Columbia introduced the lack of First Nations tribes recognition in Canada. Brown explained that even though majority of tribes do not have formal recognition treaty arrangements with the Canadian government, they have developed land use plans that do not allow extraction. It is the tribes who distribute land permits. We must “continue to exercise and teach our culture forever in perpetuity,” Brown stated. His tribe has been working with other first nations tribes to negotiate new land use objectives that prevent people from exploiting natural resources, so that communities can continue to sustain their own community needs. A recent court case that begins to recognize First Nations can be attributed to collective pressure from various tribes on the government. Elders have formed groups to qualify their research and knowledge, and developed relationships with other tribes to increase their ability to collectively manage their territories and natural resources. “The more we came together, the more strength we had, and in the end, we realized that it was the Canadian government that was keeping us apart,” said Brown on collective action. “If you are indigenous and you win a court case, make sure that you put your own policies and laws in place to protect your communities”. 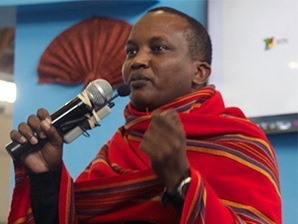 Shani Ole Petenya Yusuf, a Maasai member and Trustee of the Environmental Trust Fund and Shompole Ranch Group, explained how his organization has been able to conserve the unique beauty of a biodiverse area and market it to the outside world in a dignified and beneficial way for communities. “In order to establish conserved areas, people must be able to justify what they want to conserve, and how it will benefit the community” said Ole Petenya. His organization has set aside 10,000 hectares for strict conservation and has worked with private investors to build luxury eco-lodges that have contributed to building community infrastructure. Though the area has been affected by more frequent droughts, the conservation area has improved community life tremendously. The Shompole Ranch Group is an Equator Prize 2006 winner. 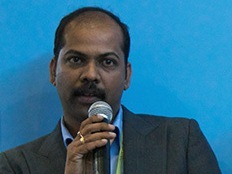 Anoop Krishnamma is a Research Scholar with the Kerala Kani Community Welfare Trust in India. 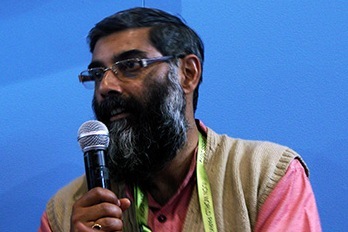 Krishnamma described his organization’s work as a unique partnership between communities who apply traditional knowledge to create medicines and a private institute to develop marketable products. One of the biggest obstacles is that because the communities are largely comprised of nomads, they are not entitled to natural resources. Additionally, Krishnamma highlighted that land conversion continues to threaten the preservation of traditional knowledge due large scale land conversion for agricultural purposes. Willis Ombai, Project Coordinator at the Open Society Initiative for Southern Africa spoke about challenges that communal land owners are facing: “They cannot formally own their land and so they are often faced with issues of displacement.” Governments do not favor people who live in the forest, and they do not encourage practicing traditional knowledge. This contributes to the loss of cultures. 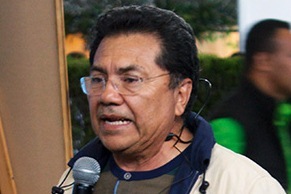 He advocated for the recognition of land rights and hoped that the group can turn their collective challenges into benefits and opportunities for the people. In the ensuing discussion, it was raised that an important note had gone unmentioned throughout the dialogue: the role of youth. In the case of the Kimberley Land Council (KLC) in Northwestern Australia, emphasis is placed on the guidance of younger rangers by their elders in order to maintain natural and cultural values. Additionally, the KLC members spoke about how they develop land management plans that go through a heavy consultative process with communities to ensure that natural and cultural values are maintained. The North Kimberley Fire Abatement Project uses traditional knowledge and modern scientific practices to reduce the amount of greenhouse gas emissions released into the atmosphere from unmanaged fires by conducting early dry season burns. A corporate partnership was formed between Qantas Airlines and the KLC to support indigenous economic development while providing Qantas customers the option to offset their carbon outputs. Megan Flynn of Qantas said that “customers want to support indigenous Australia and we provide them with the means to do that”. Since 2007, Qantas has offset over 1.8 million tons of carbon. However, new legislation has posed many new obstacles: “We need to educate the broader society about the work that we’re doing. There is pressure from the tourism industry to dictate when we burn, but fire management is based on traditional knowledge.” Globalization has posed obstacles for cultural preservation through youth and so the KLC encourages young people to work closely with their elders to share stories and traditional knowledge. Birch-Gore concluded by illustrating how much more monitoring and evaluation efforts need to happen, especially because indigenous land rights are still a fairly new concept. Biocultural heritage territories are land use mosaics, encompassing indigenous and traditional land tenure, production and exchange systems, cultural identity and community organization. They promote local sustainable development and biodiversity conservation. Moderated by Terence Hay-Edie, Project Manager of the Global ICCA Support Initiative at UNDP, the panel reflected on experiences in Peru, China and India. 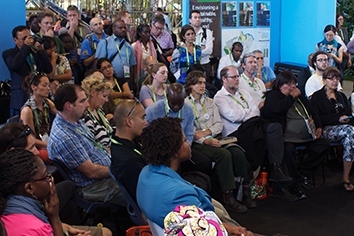 The event was co-hosted by the International Institute for Environment and Development (IIED). A short video was shown depicting the three case studies discussed during the session. All three cases are examples of how indigenous knowledge and innovations can ensure crop diversity and enable adaptation to climate change and enable food security by using a variety of crops. In Peru’s Potato Park in the Sacred Valley of the Incas, Cusco, five communities protect 9,000 hectares of land under a collective land title. Quechua customary management conserves 1,400 varieties of potato, other Andean crops, wildlife and water. Mr. Alejandro Argumedo explained the Inka heritage of the region in which the potato played a central role, especially in mountaineous areas. To him, biocultural heritage territories like the Potato Park are an expression of how the order of the world is based on ancient cosmology. 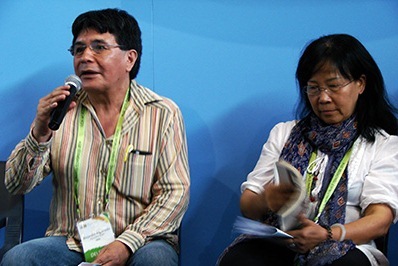 Using traditional knowledge to protect crop species resilient to climate change is a pathway for sustainable development: “Development and conservation could become one unit.” Mr. Argumedo explained that there is an International Network of Mountain Communities actively exchanging knowledge. In the Stone Village in Yunan, South West China, six communities of 2,700 Naxi people conserve more than 20 food crops and 180 native crop varieties. Ms. Yiching Song explained that “these farmers have showed continuity in farming for over 1,400 years” using ancient irrigation systems. The community has been affected by climate change, but local varieties deal better with climate change related phenomenons like drought. With the desire to protect its territory, the community called it seed park. This designation has an ecological and spiritual aspect, given that the rich Naxi spiritual life was under pressure in the last 50 years. Ms. Yiching Song said that very fruitful exchanges between the Seed Park and Peru’s Potato Park have been taking place.